What records did the Z10 break, exactly? Analysts are starting to change their tune when it comes to the BlackBerry Z10, taking a less optimistic view of the new handset's sales. Both Canaccord Genuity and Pacific Crest analyst firms recently slashed their quarterly sales predictions for BlackBerry's new touch-based smartphone, with each firm now estimating around 300,000 sales worldwide by March. In the case of Canaccord Genuity, the revised sales estimate is a significant drop from their original prediction of 1.75 million units sold. According to analysts those sales will also come along with a reduced number of handsets shipped to stores, between 1 million and 1.5 million instead of pre-launch expectations of between 3 million and 4 million. What are the actual sales numbers? BlackBerry made a big fuss over its U.K. and Canadian launches earlier this year, saying that the Z10 broke the company's previous sales records in both territories. In the U.K. CEO Thorston Heins said the Z10 sold three times better than any other BlackBerry device during its launch week. Similarly, the Canadian launch was said to be 50 percent bigger than any of BlackBerry's past launches in its home country. BlackBerry didn't offer any actual sales figures at the time to back up its record-breaking claims though, so there is no concrete data to counter the analysts' adjusted projections. 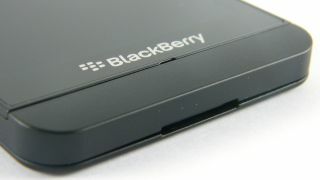 BlackBerry has not responded to TechRadar's inquiry to clarify the sales data. Part of the BlackBerry's sales trouble is due to the fact that the Z10 is not available yet in the U.S., a major market where the handset won't arrive until mid-March. While the U.S. launch will not come in time to rescue BlackBerry's sales for the end of its current fiscal year, the company now has to count on a strong launch to start the next fiscal year on the right foot.